Rated PG-13 for thematic material including some violence. Having sold upwards of ten million copies since making its debut in 2007, William P. Young’s Christian-themed novel The Shack has been one of the biggest publishing phenomena of the last decade. With figures like that, it was inevitable that a screen version would one day tap into that already-existing fanbase, while hopefully also tapping into audiences who had never picked up the book before. Though the end result may indeed satisfy fans of the book, newcomers might find themselves wondering what all the fuss is about as they watch this awkwardly-constructed work. "The Shack" wants to be a sincere exploration of faith and forgiveness but somehow manages to be both too innocuous and too off-putting for its own good. Mack Phillips (Sam Worthington) has managed to overcome a rough childhood marked by the cruelties of a drunken and abusive father (Derek Hamilton). He now has a happy life with wife Nan (Radha Mitchell) and three kids, teenagers Kate (Megan Charpentier) and Josh (Gage Munroe), and adorable moppet Missy (Amelie Eve). That all comes crashing down when Mack takes the three kids on a camping trip—Nan stays behind to do work stuff—and Missy disappears after being left alone by Mack while he rescues his other kids from drowning in a canoeing mishap. It turns out that someone out there has been abducting and killing little girls, and although the police are able to track the suspect’s whereabouts to a remote, dilapidated shack, all that is found inside is some blood and Missy’s torn dress. Time passes, but Mack is unable to get past the tragedy. It affects his relationships with the rest of his family, in a period described as “The Great Sadness.” One day, a mysterious note turns up in his mailbox asking him to come to that very same shack the next weekend and signed “Papa,” which just happens to be Nan’s pet nickname for God. When he gets there, he initially finds nothing, but, as he is getting ready to leave, the surroundings change from frigid nothingness to a lush, lovely environment and the shack is now a spiffy domicile housing a version of the Holy Trinity in which God—sorry, Papa—is an African-American woman (Octavia Spencer), Jesus (Avraham Aviv Alush) is a carpenter of Middle-Eastern descent and the Holy Spirit is represented as an Asian woman named Sarayu (Sumire Matsubara). Over the next three days, Mack opens up to the three of them in ways that allow him to mend his relationships with them, learn to forgive and gain some closure regarding Missy’s death. 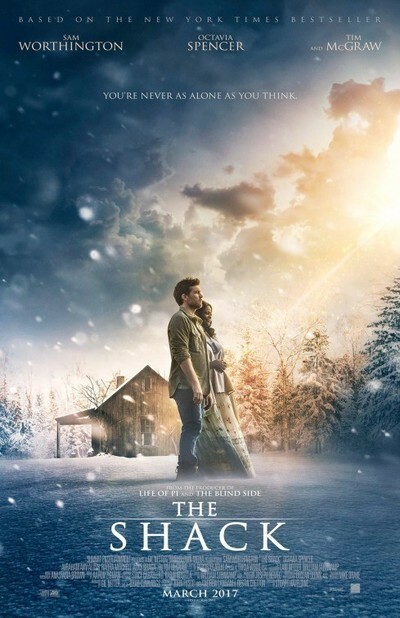 Since its publication, “The Shack” has engendered a good deal of controversy within the Christian community for interpreting both the Bible and the Holy Trinity in ways that some consider to be heretical. Based on a viewing of the movie, I would label those charges to be nonsense; to be truly heretical would require a more cogent level of thinking than the awkward plotting and empty-headed New Agey koans offered up here. Granted, trying to put words into the mouth(s) of God would challenge even the finest writers, but couldn’t the ones assembled here have come up with something a little better than the banalities being presented here as eye-opening spiritual truths? As near as I can figure from the somewhat murky thinking on display, God is responsible for all the things that are good, pure and beautiful in the world but always seems to have an excuse when it comes to the uglier aspects of life. If one has the temerity to press this particular issue, as Mack understandably does, all he gets in return is a bunch of straw man arguments that pretend to answer his questions without actually doing so. Just as off-putting are the little things that are tossed in to make God seem more relatable to us, such as the moment where, out of nowhere, Papa reveals that she is a Neil Young fan. I would have forgiven this if it had led to Mack asking why she would allow that hideous album featuring all the songs about his car to exist. For all of the pontificating on display, there is precious little in the way of a coherent narrative for anyone who does not already buy into "The Shack'"s way of thinking. Oh sure, there are plenty of plot details on display but the screenplay is more interested in just mentioning them than in really dealing with them. We are told about the estrangement Mack has with his family following Missy’s murder but aside from one very brief scene, we get no real sense of it. Possibly because to do any more might further underline the fact that it is the older daughter, who caused the canoe accident and is wracked with guilt over it, who should really be meeting with Papa and Co. instead of him. The film opens with a chronicle of a young Mack and his mother being beaten by his father that culminates with the suggestion that he straight-up murders the old man, only to never refer to it again; not only does Papa fail to bring it up during their conversations, his own dad, in spirit form, never mentions it while he is begging his son for forgiveness. As “The Shack” plodded on (it clocks in at over two hours and makes you feel every one of those minutes), I found myself thinking more and more about “Silence,” the recent religious drama from Martin Scorsese that came and went through theaters a few weeks ago. Like “The Shack,” that film dealt with the kind of spiritual crisis that can develop when someone devotes their life to praying to a God that seems more interested in letting you suffer endlessly rather than answering those prayers. But "Silence" took its questions about spirituality and the nature of God seriously, resulting in a spellbinding film that even those without any sort of strong religious background might still find thought-provoking. “The Shack,” on the other hand, is little more than pabulum that invokes all the right words but fails to invest them with any kind of meaning that might allow it to mean something to those not already pre-disposed to liking it. Of course, thanks to the book's extensive fanbase, there is an excellent chance that "The Shack" will make more money in its first weekend than “Silence” did in its entire run—a thought depressing enough to inspire spiritual crises in any number of moviegoers.